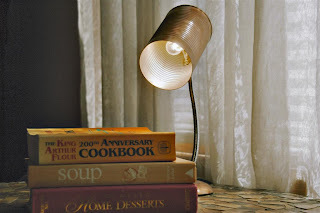 A four dollar lamp from GW and a pineapple juice can make a simple custom lamp. Cut off the original shade with tin snip (or now that I know what I am doing, I could say dismantle the wiring and remove original shade). Using the original shade as a template, drill all appropriate holes in your can. Use a Dremel or other tool to sand off all burrs left from the can opener and drilling (you don't want the can snagging or cutting people). 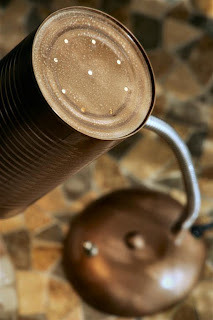 Spray paint the inside of the can silver (this helps hide the seam a bit and any drill marks) and spray paint the outside with hammered copper). 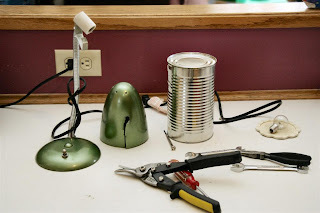 Reassemble your lamp (I had a friend who knows wiring help me do this, if you know how to wire a lamp do it yourself or you can do like I've done in the past and bring it to a hardware store or handyman that does small repairs). Now you have your own can light!! 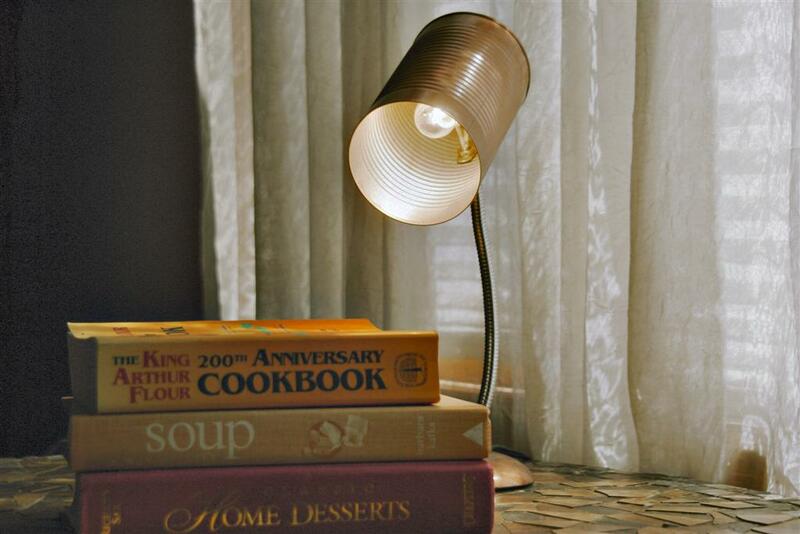 I think she is just perfect for the kitchen - she provides great task lighting. I made her for the Fireflies and Jellybeans Iron Crafter Challenge. 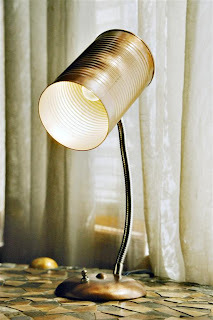 Check out my collection of Tin Can Crafts for inspiration!! That looks great, very industrial. Melissa this is too cool! I love it! Great Job! 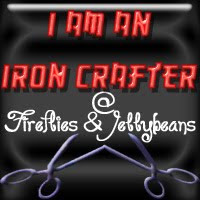 THanks for entering The Iron Crafter!! That is ingenious! Good luck! Okay . . . you are amazing. I can't believe you made a light from a can! Thanks for stopping by twelve crafts earlier and becoming a follower. I'm so glad you did because now I get to be your 99th follower. One more and you'll have 100. So exciting!!! I really like this. Very cute! I like the modern look to it and what a great way to recycle. I agree...Perfect for a kitchen! Found your post at Sugar Bee - this is such a brilliant idea and it looks antique and charming. This is awesome! It looks a little industrial cottage-like and that's my kind of thing! I may give it a try. Now that's an ingenious reuse! 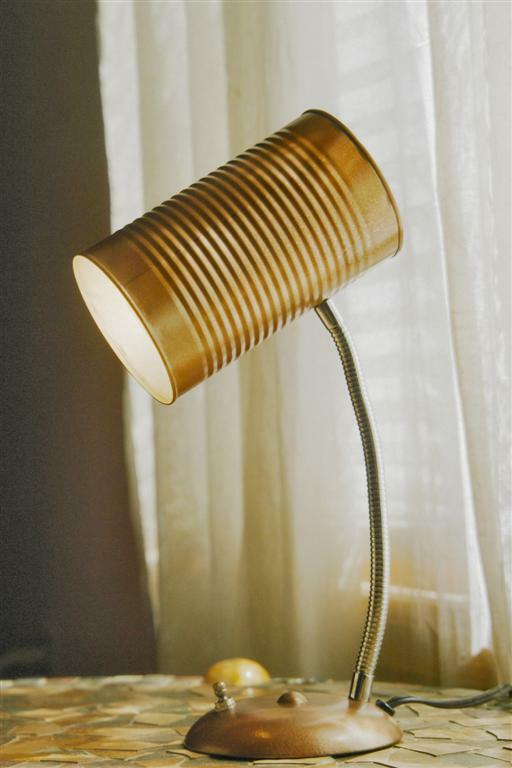 Who would have thought of using a tin can for a light. Well, you of course! I'm starting three linky parties this week. The first one went up last night, and I think you have some great tips to share. Melissa, I really like how this turned out! Love the melding of common items with something different for an end result of a unique piece. LOVE love love the uber cool industrial feel this has! FABULOUS! SO glad I saw this on Somewhat simple! You can tell I am way behind and catching up... your lamp is awesome; you will probably spark a copy-cat version by the folks at Anthropologie! How did I not see this before? I love it!!! Oh, I was traveling. So glad you mentioned it in your breadbox post. This is such a classic! Oh my goodness I LOVE this!! It so modern, yet retro- can't wait to make one myself!